I’ve been pretty quiet online this month for a number of reasons. I still haven’t adjusted to the fact that over 60 million of my fellow US-Americans elected Donald Trump to be our president. I cannot look at that man’s face on my computer or television screen without feeling dismay and sinking despair. Attending and photographing protest after protest has not really done anything to help address these feelings. Regardless, I don’t feel much like blogging when I don’t get much feedback on my posts. But if I turn comments back on or resume posting on Facebook, I will subject myself to harassment and micro-aggressions that I’m not equipped to handle right now. I’m not talking about genuine criticism, but racist and trans-antagonistic attacks. I have still been active on Wikipedia at least, contributing several articles to this month’s Black Women Online Editathon. I’ve also submitted a proposal for the annual Wikimania conference, taking place in Montreal this August. I’ve switched my DuoLingo language preference to French to try to pick up a bit of that language before visiting the Francophone province of Quebec. But mostly, I’ve been overwhelmed and trying to escape the world with television and video games. After finishing watching every episode of The Jeffersons, I began watching The Mary Tyler Moore Show after that actress died last month. And after growing bored and frustrated with the bugs in the latest version of The Sims, I started playing a new game, Stardew Valley, which I’ve been thoroughly engrossed in for the last two weeks. I might blog about it from an animal rights perspective at some point. So I am still alive, but not well. Although I’ve turned off comments, I am still reachable by e-mail if anyone would like to send a friendly note. 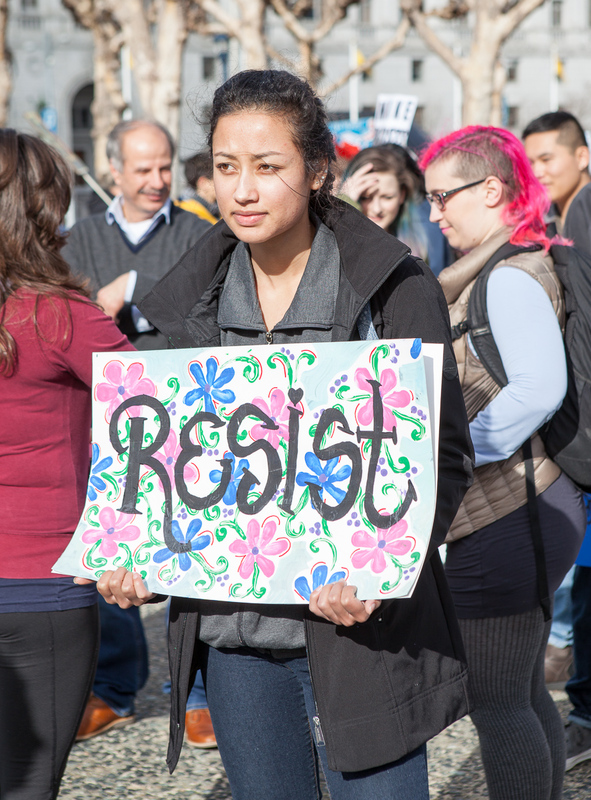 On Saturday I attended a protest of the executive order limiting U.S. immigration for the purported reason of “Protecting the Nation from Foreign Terrorist Entry into the United States“. 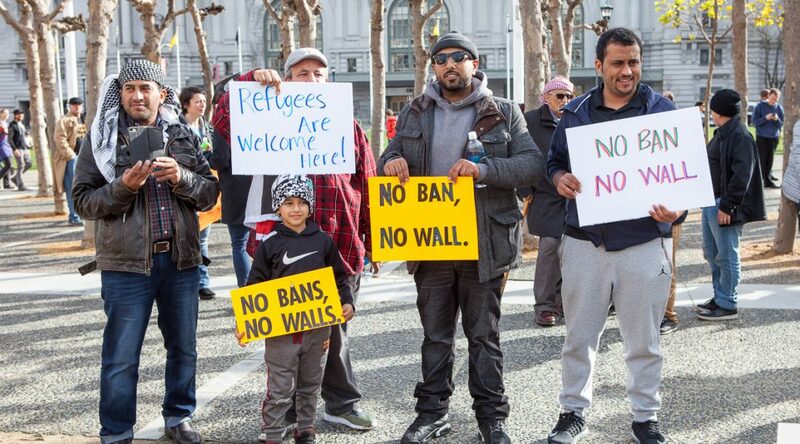 While it was no surprise to many that Trump would attempt to fulfill his campaign promise to ban Muslims, protests occurred throughout the country, especially at airports, after he signed the order. 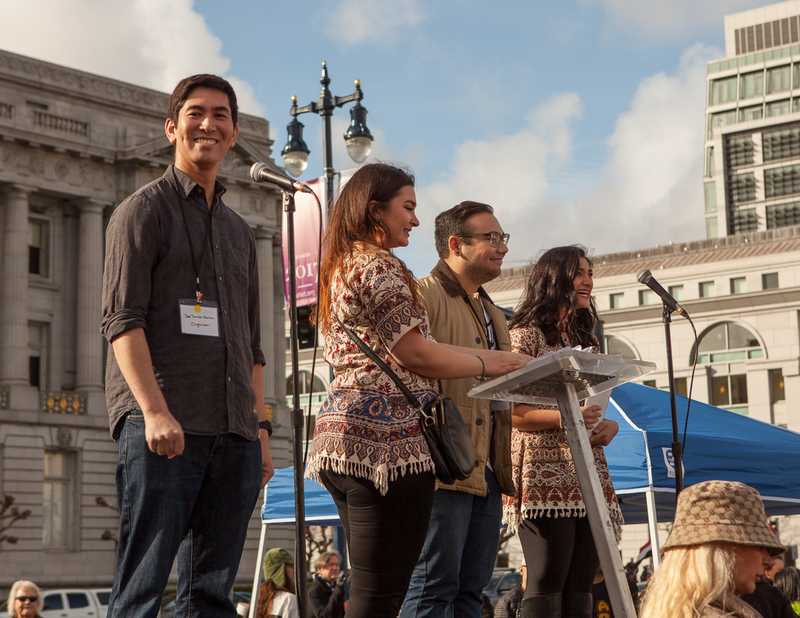 I missed the large protests at SFO the previous weekend, but then found out about this rally at Civic Center, which was reported on before, during, and after in local news media. The event was organized by a handful of individuals rather than a formal group, and they did a reasonably good job, securing a stage, sound system, and multiple volunteers acting as security. They emphasized that this was to be a peaceful rally, as many were nervous following the violent outbreak that forced the cancellation of a Milo Yiannopoulos speech at UC Berkeley last week (which made national headlines). But that was a completely different situation, where black bloc protesters came in to disrupt an unrepentant bigot who had already been banned in venues, including Twitter, worldwide. 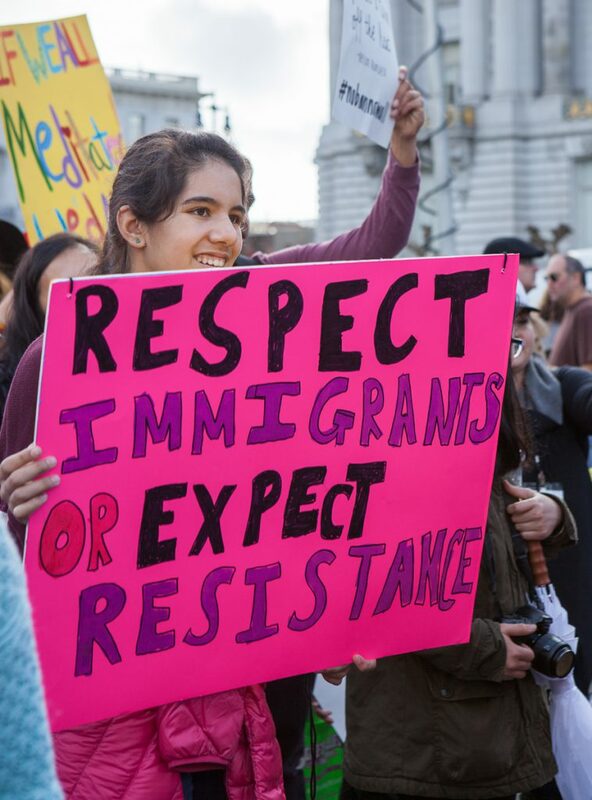 San Francisco representatives have been outspoken in support of immigration, so there would be little cause for that kind of a demonstration at City Hall. Speakers included immigrants and children of immigrants. Many spoke about their love for this country and our (supposed) values. I wasn’t too enthused by this, preferring the more radical tone of the A.N.S.W.E.R. Coalition rallies I’ve attended. 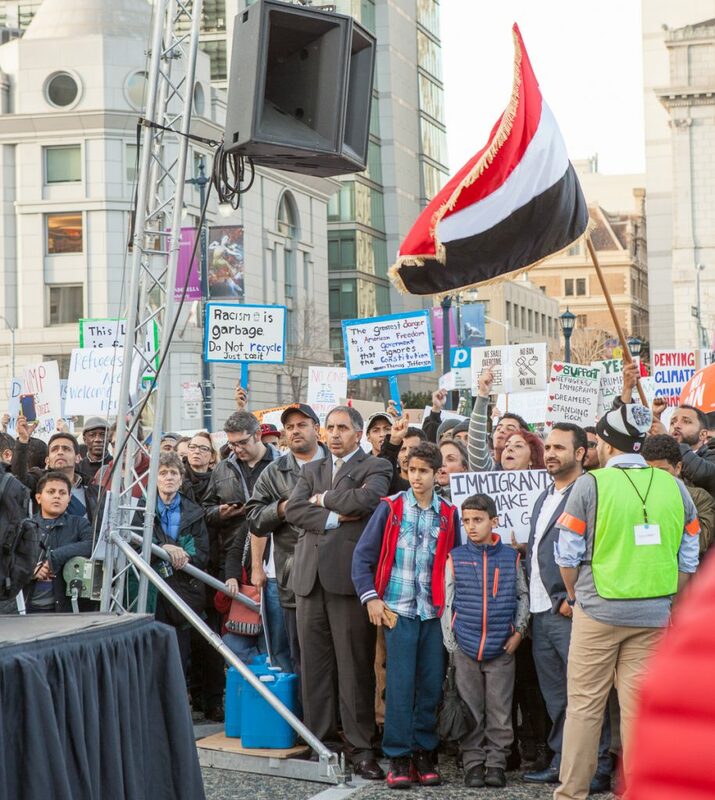 One of the speakers, new San Francisco supervisor Ahsha Safaí, suggested that we not continue the protests of Uber, but instead encourage companies like them to contribute matching funds, and only delete their apps if they don’t comply. I wasn’t thrilled with Uber even before Trump’s inauguration, personally; this is the sort of capitalist apologism that wouldn’t likely occur at an A.N.S.W.E.R. rally. There was some criticism on the event’s Facebook page that too many speakers were from the tech industry and government, and that no ASL interpretation was provided, which were valid concerns. Regardless, I appreciated that the event was organized by and centered people of color and people of Muslim heritage. 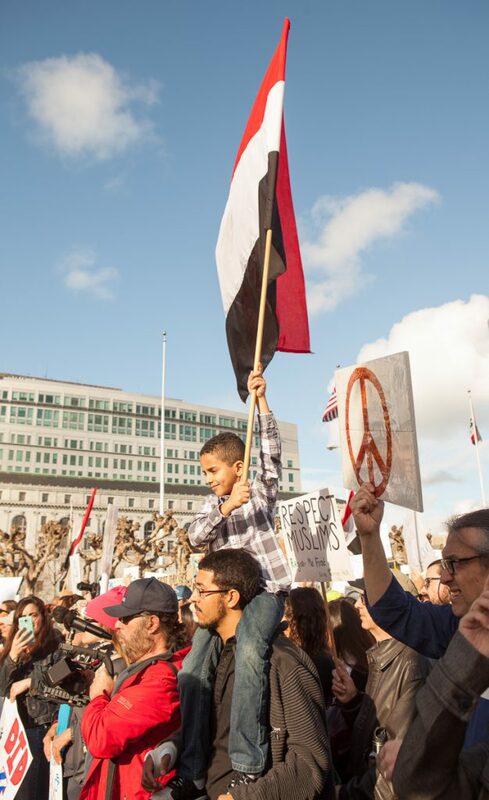 A number of people in the crowd carried the flag of Yemen, one of the seven countries affected by the immigration ban. The rally continued for a full three hours (as scheduled), but I left halfway through, as I needed to rest and relax before running a half-marathon the following morning. Protests are certain to continue, despite a federal judge putting a temporary stop to the travel ban. I said the day after the election that this would not be a peaceful transition of power, and I meant it; I expect massive unrest in the coming weeks, months, and years, for as long as the Trump administration remains in power. My full set of photos from the event is available on Flickr. Some photos are also available (alongside those of other contributors) on Wikimedia Commons. Please credit me as Pax Ahimsa Gethen if you use any of my photos, thanks!